An artist who means so much to so many: both tragic victim of the studio star system and ultimate Hollywood legend, the ever-enduring appeal of Judy Garland is enough to ensure a full house wherever her name appears. Judy – The Songbook of Judy Garland is the only production officially sanctioned by the Garland estate and features youngest daughter Lorna Luft accompanied on this whistle-stop journey through the musical career of her mother by West End leading lady Louise Dearman, X-Factor, Brookside and Dancing on Ice alumni Ray Quinn, an array of seasoned musical theatre veterans and backing dancers The Boyfriends. The show format is a familiar one, live performances are interspersed with video snippets of Garland’s most famous movies and a few unseen interview clips of the star, looking it must be said, fragile and vulnerable, as well as some personal anecdotes from Luft about life with her famous parent. These personal reminiscences are a welcome touch and provide a tangible link from audience to superstar, that said, it would have been nice to utilise this very real connection and allow Luft more show time talking rather than singing songs which only her mother can truly give justice to. There is a quality which permeates the whole production, from the set design of Colin Rozée (a Hollywood studio stage) with its black, red and white motif that carries through to the costume design, to the first class cast. Dearman and Quinn are the standouts in a universally talented line-up. 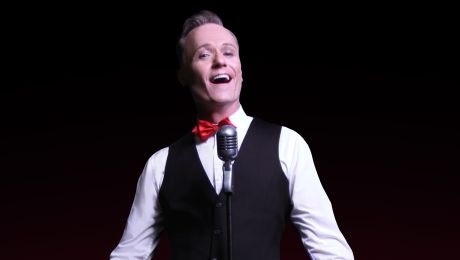 Dearman’s “Stormy Weather” is a showstopper and Quinn surprises and delights, most notably in his duet with Darren Bennett, “Puttin’ on the Ritz”, being both fleet of foot and in extremely fine voice. Bennett, it must be said is a class act, singing and dancing beautifully throughout. Dearman and Luft also memorably recreate the now famous 1962 duet between Garland and a then unknown Barbra Streisand. The musical arrangements are excellent as is the choreography and there are some nice touches in the projections especially in “The Trolley Song” where background and onstage action merge beautifully and to great effect. For all its quality there are a few quibbles though: a couple of technical glitches were handled quickly and professionally but an out of synch video of Garland singing “Mr. Monotony” did ruin what could have been a powerful moment. The celebratory tone is brought to an end by a melancholy tribute to Garland and her most famous song, as the first notes ring out from “Over The Rainbow” the production to its credit, realises that no one else could come close to the star’s iconic rendition, leaving Judy in her gingham dress to sing alone. This is very much a production that gives its target audience what it wants. With nigh-on 30 songs on the bill and a first-rate cast, the audience can’t complain it doesn’t get its money’s worth. A fine, quality tribute to a Hollywood legend.